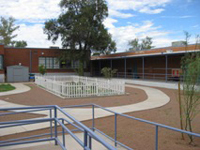 Robison K-5 School was named for Roy H. Robison, a former principal of Safford School and also assistant superintendent of District 1. Robison served for 27 years in the District and died unexpectedly April 23, 1948, while attending an education conference in Phoenix. He was 53 years of age. Born in Arkansas, he graduated from East Central State Teachers College and held degrees from the University of Arizona and the University of Oklahoma. 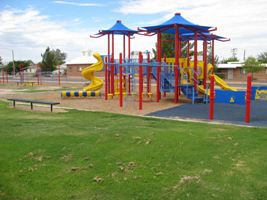 Before coming to Tucson, he was superintendent of schools at Wetumka, Oklahoma for two years. He joined District 1 in 1921 and shortly afterward became principal of Safford Junior High School. He was appointed assistant superintendent in 1942. Robison, according to Superintendent Morrow, "had an ever-increasing capacity for outstanding accomplishments in the field of education." At the time of his death he had been working on a revision of the arithmetic courses for the schools as well as a revision of curricula for junior high and elementary schools. "He was particularly effective in working with children as well as with teachers, with playground whom he had done a great deal of personnel work." Robison was active in Boy Scout work and served as president of the Catalina Council of Boy Scouts in Tucson. He aided the Kiwanis club’s youth program and was one of the originators of the Community Chest organization.